As a style-conscious man, we don’t need to tell you how important good footwear is – it can make or break an outfit instantly. Classic footwear silhouettes such as loafers, brogues, monk-straps, Oxfords and Derbies are the sartorialist’s bread and butter. But while all these shoes rightly deserve their place in our wardrobes, there are occasions when something new is needed. Experimenting with your footwear, particularly these timeless styles, is a brilliant way of injecting individuality into your looks without compromising on form or function. And the spring/summer season offers you the perfect opportunity to do just this. Colours are brighter, patterns are bolder, styles are more laid-back and everybody is just that little bit happier (read: accepting). But you don’t have to go all-out to make a statement. Something as simple as a textured material or contrast sole can completely transform an outfit and separate your look from the crowd. Although we would always recommend investing as much as possible in your footwear, good shoes doesn’t always mean expensive. We all know that handmade, Goodyear-welted footwear from Northampton-based manufacturers is the very best available on the market, but – particularly in this scenario – try to think of a good shoe being the right shoe. Spend less on trend-led footwear and it leaves you with more money to splurge on those timeless classics that almost dictate investment. 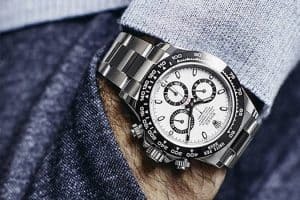 Seldom will a statement design be relevant for more than a season or two, and it’s even rarer to find a style that will transition through both spring/summer AND autumn/winter, but they do offer the perfect way to liven up your wardrobe at a moment’s notice. Below we have featured a selection of high-end and high street footwear in order to provide something for all budgets. Yet regardless of whether you spent £20 or £200 on your shoes, you should still be looking to extend their lifecycle by polishing and protecting them in exactly the same way. The addition of a chunky sole is one of the simplest and most effective ways of updating a classic silhouette. Crepe, wedge and vibram soles are increasing in popularity each year and will immediately change the shape and, more importantly, weight of a shoe. Crepe Sole: crepe rubber is a crude form of natural rubber that is relatively inexpensive to produce. A crepe sole is traditionally very soft and often found on desert/chukka boots. It wears quickly and is best suited to spring/summer. Crepe soles tend to pick up stains quite easily but discolouration can add natural charm and character to your footwear. Wedge Sole: the sole and heel is crafted from the same ‘wedge’ of material, often rubber, meaning there is no clear height differential (or ‘step’) between the two. Offering excellent traction, they are traditionally found on boots although many modern designers have started applying them to traditional lace-ups styles such as brogues, Derbies, loafers and Oxfords. A good year-round option as they cope very well in icy, snowy and wet conditions. Vibram Sole: Also known as a ‘Lug’ sole, Vibram is actually a brand of rubber soles that is traditionally found on heavy duty styles such as worker and hiking boots. Again, the industry has begun to apply Vibram soles to more traditional silhouettes, producing hybrid shoes that offer a nice blend of fashion and function. With a thicker sole it’s important to pay close attention to the fit of your other garments, especially when it comes to the length of your trousers. A chunky sole will make the shoe appear much heavier, so your outfit needs to adjust to suit. Think slim or straight legs over skinny, with regular fits on top. Offering a fashion forward take on timeless silhouettes, these shoes work well in outfits built to play on classic looks. For instance, you could combine a pair of rubber soled penny loafers or brogues with slim navy chinos, an Oxford shirt and dark varsity jacket for a modern take on the Ivy League aesthetic. Alternatively, play on traditional work wear styles by teaming a black pair of wedge sole Derbies with slim denim, a thick twill overshirt and brightly coloured fisherman jacket. Despite their sometimes intimidating appearance, these shoes will slot seamlessly into your existing wardrobe. They don’t shout about their point of difference but when noticed the effect on your outfit is quite dramatic. Key brands to consider include Dr. Martens, Red Wing, Office, Clarks Originals, Grenson and Bertie. If you’re looking for footwear that demands attention, bright colours are the way to go. When an outfit feels too safe or reserved, a pair of pop-colour shoes will give it an edge without pushing your boundaries too far. White/Beige: Although not technically a ‘colour’, white or beige shoes are striking and will stand out effortlessly among ubiquitous shades of tan and black. Being neutrals, these will pair with everything in your wardrobe and are also on trend. Bonus. Red: Another huge colour trend for SS14, red shoes make an unapologetic statement. Definitely one for the confident male, they will help bring any outfit to life. They look particularly great when paired with blue or navy legwear. Shades Of Blue: A colour that plays a prominent role in most men’s wardrobes, blue is extremely easy to wear. This applies to footwear too. Whether you opt for a pair in navy, pale blue or striking cobalt this season, they will slot straight into your personal style and can be teamed with everything from relaxed tailoring for summer events to a shorts and t-shirt combination at the weekend. Contrast Soles: For those that are building up their confidence with colour, or simply want to add an unexpected focal point to their outfit, a contrast sole offers the perfect compromise between statement and subtlety. For maximum impact, look for styles that combine a neutral upper with a shot of striking colour – think navy/black uppers with orange/yellow soles. When choosing your perfect pair, bear in mind that bright colours generally look much better in suede than leather – the former offers a natural, textured feel and is also much more seasonally-appropriate. Coloured shoes are available at all price points this season. If you are considering a statement style in red, orange, yellow, green etc. then it would be wise to spend less and shop the high street. On the other hand, opt for a timeless neutral shade such as white, beige, navy or grey and they will get good use for many years to come. You can therefore invest slightly more, should you wish to do so, and consider brands such as Grenson, Mark McNairy, Ted Baker, Oliver Spencer, Tod’s and Church’s. Instead of making an overt statement, like pop-colour designs, shoes made from unique materials will help introduce texture and depth to an ensemble – catching the eye rather than demanding attention. Grained/pebbled leather styles will add a point of difference to your current smart-casual looks in an understated way, while patent or hi-shine shoes are great for giving formal wear or tailoring a modern twist. On the more casual end of the spectrum, canvas and twill shoes are seasonally-appropriate options that add texture and character while maintaining the identifiable shape of classic footwear. Check out Castaner, Dune and John Lobb for a range of canvas lace-up silhouettes this season, while Lacoste and Vans have produced a selection of trainer/shoe hybrids that offer the best of both worlds. 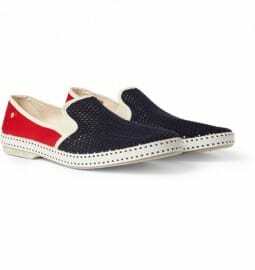 Woven slip-on silhouettes have become extremely popular over recent years and provide increased breathability, making them well-suited to holidaying and high summer. Whether you prefer leather or canvas construction, Rivieras, Office and Hudson are all great ports of call for contemporary woven designs. Two-tone shoes are on trend for 2014 and make a refined statement. Generally coming in brogue or loafer form, there is now a combination for every taste: fabric mixes, contrasting colours or patterned inserts can all be found on the current market, with quirky English brands such as Paul Smith and Ted Baker excelling in this area. Arguably making even more of a statement than a bold coloured pair, patterned styles are much harder to pull off and take a lot more thought to incorporate into your everyday look. Where possible, stick to neutral base tones and small scale motifs to make them as versatile as possible. Anchor with neutrals and wardrobe basics to avoid overloading your look and allow the shoe to become the focal point. Patterned footwear is trending due to the industry’s current obsession with everything printed, however, these will likely fall out of favour quickly so don’t spend more than you have to. Affordable high street retailers Topman, River Island and H&M are sure to stock a wide variety of patterned footwear. So there you have it, three distinct ways that designers and brands have altered classic footwear silhouettes to suit the current market. Provided you use them in a balanced way, these modernised classics will make a real difference to your summer wardrobe – taking it from good to great. Have you invested in any of the styles showcased today? Or do you strongly believe that ‘if it isn’t broke, don’t fix it’? What unusual fabrics or colours do you have in your shoe collection? Does a chunky sole work on traditional lace-up silhouettes?